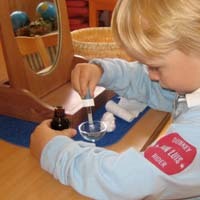 The guiding words of Maria Montessori - “help me to do it myself” - provide the focus for our preschool programme here at Lilli and Lori. This concept forms the ideal basis for primary and grammar school readiness whilst also giving the children valuable skills to take with them through life. The children today are faced with ever-changing challenges and have increasing expectations put upon them as they grow and develop. Our curriculum addresses each individual developmental stage of the child and fosters the natural development of critical thinking, positive social awareness, self-reliance and creative speech. 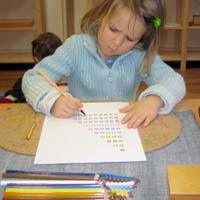 The children are given, through play, early exposure to numbers and letters which in turn provides them with early foundation which they need for reading and maths.